These days I find myself making extensive use of Google Docs. This is the tool of choice for the LACE project I am involved in. Although Google Docs doesn’t have the power of MS Word it does provide access control capabilities which are important for project work with partners working at different institutions across Europe. As a long-standing user of MS Word (since its days which it competed with WordPerfect on MS DOS!) I have become accustomed to its functionality and user interface. As I described in a post which summarised the collaborative authoring approach myself and my co-authors used in writing a “Paper Accepted for #W4A2012 Conference” I have made use of MS Word and Microsoft’s Onedrive (then called Skydrive) so that we could edit the document using our preferred authoring tool. Since our paper was hosted in the Cloud we could edit a single copy and avoided the problem of authors editing multiple copies of a paper. However although the approach worked for a small group of authors who were happy to use MS Word, it is not necessarily the best approach when there are a more diverse group of contributors. In my current environment we used a shared Google Drive folder and I typically create project documents using Google Docs and receive contributions and comments from project partners. Some of the documents, which are intended for use by the project team, will continue to be hosted on Google Drive. However other documents. which are intended for submission to the European Commission, will migrate to an MS Word environment using the project’s template for submission of deliverables. 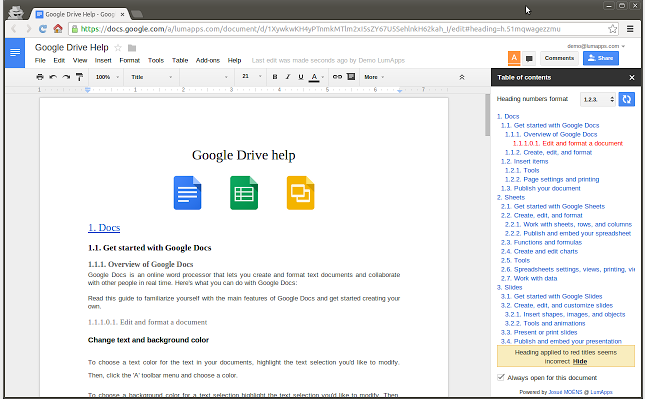 I have recently started to explore ways to enhance the Google Docs environment for producing documents. Sometime ago I installed the Google Docs Table of Contents add-on which, as shown, provides a document outliner which can be useful, especially for longer documents, in depicting the document structure. What Do I Do Need to Do More in Google Docs? It seems that at some point I also installed the Gliffy Diagrams add-on, which can be used to “create professional looking diagrams and flowcharts in Google Docs“. As I often include diagrams in documents I produce using MS Word I have felt the need for such functionality, but I haven’t got around to using this tool on a regular basis. This may be because I use Google Docs as the initial authoring environment but produce the final version in MS Word and use MS Word tools for embedding images and producing the polished final version. But what more do I need to make greater use of Google Docs, I wonder? 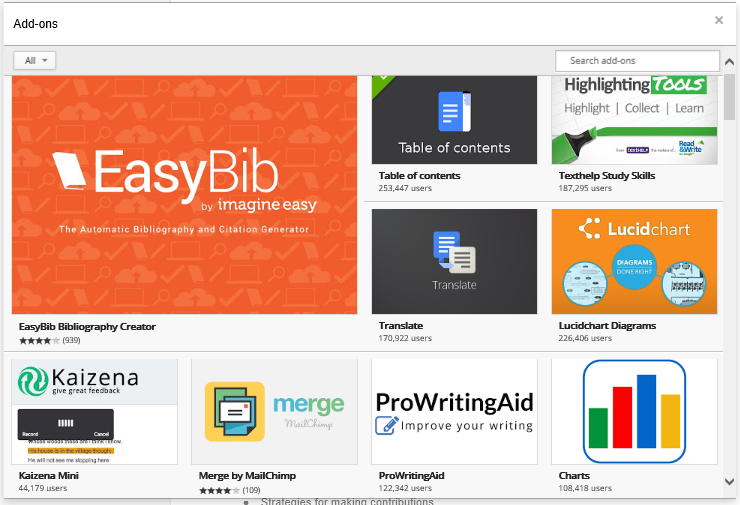 Google announced the launch of its add-on store for Google Docs’ spreadsheet and word processor apps. The store, which resembles the Chrome Web Store in its design, currently features about 50 add-ons, with more coming in the near future. According to Google, the idea here is to provide users with new tools that will give them access to more features — especially features that aren’t currently available through Google’s own products. I’d be interested to hear if anyone has experiences in use of these add-ons for Google Docs. Are there any power users who are using Google Docs in sophisticated ways and are making use of add-ons to enhance the functionality of the service? As a long-standing user of MS Word I can remember when using a word processor was a solo experience. However nowadays tools such as Google Docs are designed to provide collaborative authoring environments. Such tools also provide collaborative commenting and viewing capabilities, with the ability to manage access to document, co-authors, commenters or viewers. There will therefore be a need to understand best practices for managing access to Google Docs. This will go beyond the use of folders and file naming conventions: there will be a need to make use of scaleable approaches which will enable authors to be able to manage large numbers of documents shared with potentially a wide range of contributors and viewers. Giving world write access to documents is one way of managing access, but this approach does have risks! Note that there will also be a need to manage access when collaborators leave projects or change their host institution. I suspect there will be a lot of sharing of open source tools at the event. But I wonder if making effective use of mainstream tools such as Google Docs will be covered? And if such issues aren’t addressed at events such as #RezBaz, who will take responsibility for training of postgraduate students? This entry was posted on 20 Nov 2014 at 5:01 pm	and is filed under General, Web2.0. Tagged: #RezBaz. You can follow any responses to this entry through the RSS 2.0 feed. You can leave a response, or trackback from your own site.